Just Being Frank: Someone please cure cancer, my feet hurt. The breast cancer 3 day walk is just three short weeks away - and my co-walker Debra and I are so honored to be completed with our fundraising. We have surpassed our goals thanks to our family and friends. Thank you all so much for your support. Our last training walk took us from our condos downtown Minneapolis, to Debra's boss/friend/relative's house in TONKA BAY. Now most of you have likely been to Excelsior, land of delicious ice cream, a beautiful lake, boats, restaurants. It is a long drive, but worth it on occasion. You know, you pack the car with an apple and a diet coke and get on the road preparing for the 'trip' to Excelsior. Well, the fine city of Tonka Bay is located approximately 700 miles past Excelsior. And we walked there. Okay, maybe not 700, but it is 4.4 miles further than Excelsior. And 4.4 is a lot when you're coming from downtown Minneapolis. 4.4 is a lot in a car. 4.4 more miles when you've already walked 15 seems like you have just crossed the Indian Ocean. We made it, thanks in part to the fine port-a-potties in Wayzata who were displayed in front of us like a mirage of water in the desert. 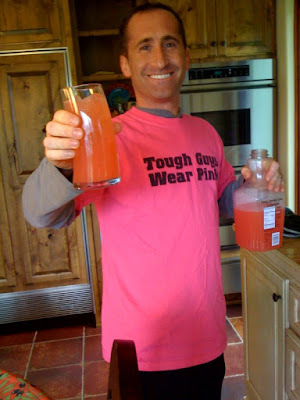 And when we arrived, 700 miles away from our home, David was greeting us in pink...with pink lemonade...and delicious food (it truly was good, but he could have fed us dirt and I would have looked at him longingly like he just prepared the finest Manny's steak). If anyone's up for a bit of walking this weekend we would love some visitors. You don't have to do the whole thing, join us for a lake or two, or a walk to Maple Grove (where we will be venturing this weekend!). Like I said. Someone please cure cancer. My Feet hurt. I'm in!! I have no life after tomorrow and I can't wait to rejoin the world!